This is my journey to the truth about vaccines. But I think it’s THE most important issue threatening the health of the current and next several generations of the Western World. This is quite possibly more important than the quality of foods they eat, the toxic air they breathe, the quality of water they drink, how much sleep they get, how much stress they endure. 1. God loves them so much he sent his son to die for them. 2. Vaccines negatively affect their God-given health. You know how I’ve said that I question everything, to make sure that I arrive at what is TRUE? Sometimes questioning things that others accept can alienate you. And I don’t like being alienated. But it’s important to me to protect my children, so that I can stand before God in good conscience, knowing that I didn’t cause them harm. And I feel that I have the responsibility to share what I've learned with others. When we vaccinate, we are blatantly and violently opposing God’s design for the body’s internal ecosystem. It’s no surprise that when we disregard His rules for nature, new problems pop up: autoimmune diseases, autism, anaphylactic food allergies… These things didn’t exist before vaccines! But I’m getting ahead of myself. I didn’t see any of that when I was first researching vaccines. Actually, as a child, I was fully vaccinated, and so was everyone I knew. Nobody questioned it at all. We thought that whether they worked or not, it really couldn't hurt — it was like wearing a seat-belt in a car accident. I did get real chickenpox, though, as that virus was still considered harmless (enough that my mom exposed us to it purposely when the neighbor kids got it) until the new vaccine for it came out. When I was an elementary kid in the large suburbs surrounding Washington DC in the early 1990s, I didn’t know anyone with eczema, peanut allergy, or any sensory disorder. The special education class (in my large public school) was tiny, and consisted primarily of those who’d had birth injuries (cerebral palsy), hearing impairment, or Down’s Syndrome. I didn’t hear the term “autistic” until I was in high school, and when I heard it, I thought someone was mispronouncing the word “artistic”! And as vaccines were added to the childhood schedule, everyone gladly accepted them. We all accepted them, as anaphylactic allergy to peanuts began to be a real issue. We accepted more of them, as more and more kids (me included) got life-threatening asthma. We kept accepting them, as suddenly nearly everyone acquired seasonal allergies (even though almost nobody had them before). We kept lining up for new shots, as the rate of autism shot through the roof (1 in 10,000 in the 1970s to 1 in 36 in 2016) and kids across the US developed sensory disorders and debilitating seizure disorders. The first time I met someone who hadn’t been vaccinated, I judged them severely. They were a very stereotypical homeschooling family, with numerous home-birthed kids, the girls with long denim skirts, and hair hanging to the floor. They were extremely healthy, but I didn’t notice that. I thought they were so irresponsible and weird not to vaccinate! They were endangering these kids! What if they got polio?! When Jeff and I got married, we agreed that vaccinations were important, and fully intended to vaccinate all of our future children. In 2007, when I was first trying to get pregnant, I entered some online conversation boards about pregnancy and newborn parenting, and saw some incredibly heated debates about vaccinations. “What on earth? !” I thought. “Internet wackos! Who wouldn’t want to protect their precious babies against all those awful diseases?” And I didn’t click through that topic on those boards again. It was only when I was pregnant with Grace did I give the topic a second thought. When I had accepted the idea that Grace was past the point of miscarriage and that I was really going to have a baby to take care of, I went to Barnes and Noble to find a book that I could use as a resource about infants. I wanted to read about feeding and sleeping and diapers and all the things, and I picked up the thickest, most thorough-looking resource I saw: The Baby Book by Dr. Sears. This was serendipitous, because his parenting style was almost exactly like my own parents' had been — extremely loving and invested, breastfeeding on demand, lots of carrying baby around, responding immediately when the baby cried, and sleeping in bed with them (though I was resolute NEVER to do that)— also called “attachment parenting.” This book had a section on vaccines, basically saying that they were good, but that parents should read more. The author’s son had a book on just that topic, and I admittedly knew NOTHING about what was in vaccines, so back to Barnes & Noble I went. It was called, “The Vaccine Book,” and down the rabbit hole I fell. This book listed each vaccine on the CDC’s childhood schedule in a dry, organized fashion, and stated the ingredients in each vaccine, the risk of your child contracting the infection being vaccinated against, and their risk of suffering a side effect from each shot. Simple enough. Just on my first skim-through, my mind was blown, as I learned how differently each vaccine worked in the body! I had always assumed you either accepted all vaccines as wonderful and necessary, or you rejected all of them because you were crazy. So I sat at the pool in the gorgeous summer sun, letting my growing baby bump get good and tan, and underlined page after page, taking breaks to read things aloud to Jeff. We’ve always talked through major parenting decisions like this — we like to be a unified front. We learned that aluminum was in many vaccines — I had already stopped using deodorant containing aluminum because I’d read how it was linked to Alzheimer's. Even more alarming was at that time, Dr. Sears said, “No one has actually studied vaccine amounts of aluminum in healthy human infants to make sure it is safe.” (Little did I know then that aluminum is destructive to any cell it comes in contact with, and has a particular affinity to brain cells. It’s far more dangerous than I guessed.) We learned that some of the vaccines’ side-effect profiles included seizures, some arthritis, some encephalopathy (brain swelling and damage), some Guillain-Barré (causing temporary paralysis), some even death or SIDS. One vaccine could cause the infant’s intestines to turn inside out! This could be found on the insert that came right in the box with the vaccine from the company that made the vaccine itself! How had we not known any of this information before? After re-reading the book at least 20 times, we decided we would still vaccinate, but we’d learned you can choose to delay or even skip some of the vaccines entirely. Why overload the baby’s system with too much aluminum at once, we thought? We would do all the vaccines except Hepatitis B (it’s for an STD, for which we had no risk factors, and it packed a massive dose of aluminum), and Rotavirus (for a diarrhea illness, which was rarely if ever fatal, and the vaccine could cause that crazy inside-out intestine side effect), and we would simply space them all out one shot per doctor visit. Done and done. We felt educated and confident in our decision. Now to find a pediatrician who could be flexible with us on this. But the first doctor we interviewed was anything but flexible. We calmly listed our concerns about the Hepatitis B and Rotavirus vaccines, completely expecting her to agree at the outset. We didn’t even get to discuss spacing out the aluminum-containing vaccines — she stopped us cold. “I don’t allow any of my patients to be exposed to unvaccinated children in my office waiting room,” she said loudly. She didn’t rise from her chair, but just scowled and said,“Yeah.” This from a doctor who came highly recommended by friends! We made appointments to interview other local doctors, but never got to meet them, because Grace died only weeks later. To this day, I’m so glad I didn’t have vaccines on my list of possible causes of her death. I blamed myself for a long time, thinking I could have done something to prevent her from getting so tangled in her cord! Losing Grace caused me to suddenly see death and tragedy and suffering as real — not some imaginary idea, or something that happens to other people. This was key to my thought process in researching vaccines, because I began to realize that vaccines were not some imaginary magic potion that saved humanity — they have real effects on the immune system, some of them devastating. And he was this vibrantly healthy baby, hitting all his developmental milestones early, breastfed exclusively, always on the upper end of the growth spectrum, not a single illness his first year and a half. (I would be negligent if I left out that he was a pretty crappy sleeper until about nine months. And extremely strong- willed, and could cry till kingdom come.) And each time I went to the doctor’s office for a well-check, and they asked if I was going to “catch up” on his vaccines, all the research I’d done on the vaccine side effects came flooding to my brain. The doctor claimed that any side effect was rare, but from what I’d then read about aluminum, the published studies showed it does damage in any amount — whether the side effect is immediately visible...or not. On top of that, I’d begun to think about autism. How could I not? As I looked around me, children were obviously displaying some worrying new behaviors that I hadn’t seen before in my entire life. I had read about the signs of autism and was acutely aware of them in the kids I saw at the pediatrician’s office, grocery store, church, and neighborhood. I saw toe-walking, hand-flapping, I saw two-year-olds who weren’t able to say more than one or two words, their obsessions with lining things up, three-year-olds who rarely made eye contact with anyone (even their own parents), kids whose brains couldn’t handle the noise level of a shopping mall. And I was heartbroken and sick over it. Mothers began wondering if their babies would become autistic, as if it were something that randomly appeared with no warning. Like it was raining down and there was nothing you could do to stop it. Lochlan was a boy, and I knew the condition was significantly more prevalent in boys. Of course, I began watching him closely to see if he had any of the warning signs. But staring at your healthy baby, expecting something terrible to happen to them, is setting yourself up for a nervous breakdown. I had to do something to prevent this. But was autism preventable, I wondered? We already ate organic, and I had been using natural cleaning products and body products since before getting pregnant with Grace. I already recorded each new solid food Lochlan ate and how he reacted to it. He was even cloth diapered, and had as many organic clothes and blankets as I could find for him. His world was clean as a whistle. With the amount of attention I paid to what went into and onto his body, I was still wondering if I could be missing something. Why were all of these kids struggling so badly (when my own generation had never experienced these problems) and could the speeding train be stopped? Since we kept turning down vaccines, the doctor urged Jeff and I to at least get vaccinated ourselves to protect Lochlan from whooping cough and flu, so we decided to take one for the team and went in for our jabs. The 24 hours following, I had the worst headache of my life, and over the course of the next year, developed an allergy to avocados! I didn't think anything of it at the time, though, and felt happy that I'd done a service to my kid...and spared his developing brain that dose of aluminum. Lochlan started walking at 10 months, and I became concerned about the risk of him getting tetanus, since I knew he'd be walking all over my parents' 8-acre farm, and who knows what dirty, sharp object he may step on or touch there. So, Jeff and I had decided that Lochlan would get the DTaP vaccine for the Tetanus part of it (because an isolated tetanus vaccine without the diptheria or pertussis didn't exist) . I admittedly knew very little about tetanus, except what I'd learned from The Vaccine Book — nothing of the history of the disease, the nature of the bacteria that causes it, how to prevent it or anything more than the fact that it was darned scary. Note to self: never make parenting decisions out of fear! Work instead from facts and logic! So at 11 months old, Lochlan got his first vaccine: the DTaP. (My goodness, even to type that gives me goosebumps.) He was apparently fine — we didn't have to restrain him, and he didn't get upset. And at 15 months, he got the next one. This time, afterward he got a fever and was super fussy, but nothing else of note. We dodged a bullet there, because I now know many kids were not so lucky. But now I was pregnant with his sister, Felicity, and my mama-bear instincts were roaring doubly-strong. Around this time, I began reading more about vaccines. A LOT more. I had found the Thinking Moms Revolution, a group of mothers of autistic children, who instead of accepting autism as inevitable, had accepted blame for their kids' disorders. These moms had read the science and discovered that a combination of factors contributed to their children’s suffering, but that toxicity — particularly from vaccines and Tylenol — had been to blame. Most had seen the dramatic decline of their children’s health after vaccinations. And many had healed their children from some of the damage — by chelating the metals and by improving their gut function. But I wasn’t going to allow myself to just assume this was true. So I started reading the inserts from the vaccines themselves — those several-thousand-word documents listing how the vaccine was produced and all of the reported side effects in the weeks following their administering. Appalled and horrified, I went further. I started reading the actual published medical studies. And the Cochrane Collaboration’s unbiased meta-analyses of the studies. And the history of the diseases being vaccinated for. I learned that in 1986, there were SO MANY kids getting seriously harmed from the DTP vaccine, that their parents were suing vaccine makers en masse. And that those vaccine manufacturers were threatening to stop making vaccines entirely — until the federal government got involved. The US government decided to make it impossible to sue either the vaccine producers OR the doctors who administered them. So if kids got harmed, vaccine production would go on as usual. So what happens now if you, say, get paralyzed by a flu vaccine? Well, you can’t sue — you have to go to the government’s “vaccine court” and beg the “special master” (who is neither a scientist nor medical doctor) for reimbursement. They may, or they may not, agree that the vaccine hurt you. Insanity. Because vaccines have continued to harm, the government has now paid $3.5 Billion to those injured by them. And the injuries continue to happen. Learn about what was happening with the DTP vaccine in this amazing documentary made at the time. Both Jeff and I received this vaccine! After Felicity was born, I began spending at least an hour a day researching vaccines. As I found the studies showing connections of vaccines to allergies, immune system dysfunction, autoimmune diseases, and brain disorders, I couldn't ignore vaccinations' harms any longer. I was being swept away in the deluge of information. As I write this today, I believe that people alive right now are the last generation to fully accept vaccination. But what about measles and whooping cough, I wondered? Don't they kill in droves when we don't vaccinate? The answer is: in the modern Western world, no. The diseases of the past killed because people were living in filth, they didn't have plumbing (their feces lined the streets, and was dumped into their drinking water supply), they didn't have heated and air conditioned homes, poverty caused shorter lives and backbreaking work (children worked! ), food shortages and malnutrition were a major part of life, medicines of the past consisted of mercury and arsenic (literally)! If a person gets these illnesses today, with access to vitamins A, C, and D, they don't die — they come out stronger. As you can see in this graph, the death rate from these diseases had already decreased over 99% by the time the vaccine was introduced. Scarlet fever completely vanished without any widespread vaccine program at all. 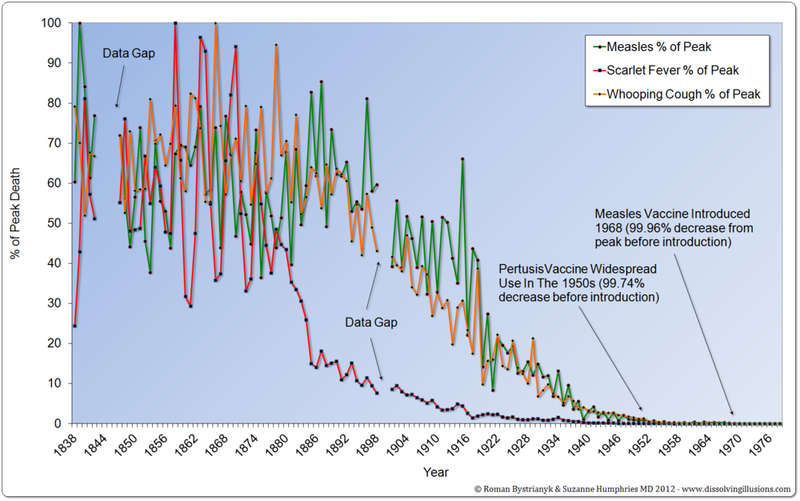 This amazing graph is from my favorite book on the topic of vaccinations: Dissolving Illusions, by Dr. Suzanne Humphries, MD. When I realized that these diseases we vaccinate against do not kill when adequate nutrition and clean lifestyle is in place, and that vaccines themselves cause immense harm, I couldn't in good conscience continue to vaccinate my family. We are reckless to assume that we can master or steer the immune system with ANY medicine or vaccine, without there being major consequences. Our bodies are designed with infinite complexity, with our immune systems being arguably the MOST complex and mysterious of the whole. Less is known about the immune system than is known about the human brain. Ask any immunologist — humans have truly NO IDEA what we’re doing when we try to intervene with a vaccine. To reduce immunity to the 9th-grade lesson on antibodies is faulty. How did people who encountered pathogens in the millennia before vaccines ever survive? The human immune system has several systems in place to protect itself, and antibodies are only one. Vaccines skew the entire immune response toward that antibody response, but this is backwards! When we force the immune system out of balance, danger ensues. The body, trained by vaccines to overreact with antibodies, develops allergies (antibodies) to harmless proteins in food or pollen or overreaction to your own body (autoimmunity). The TH1 part of the immune system, the initial fighting response to invaders, is weakened so that you're less able to respond to other infections like viruses, yeasts, even cancer! Like any ecosystem in nature, the human body's ecosystem thrives on balance. Microbes in the body keep each other in check. When one microbe is forced out, new strains of the virus, or more virulent pathogens move in. We are simply foolish to assume that we will rid of disease by vaccinating against it. My research led me through each vaccine on the CDC schedule, and through the major vaccine ingredients. I will be sharing more about them here over the next several weeks and months. And if you have vaccinated and are dealing with the effects of long-term inflammation in your body or your child's body/brain, there is hope. God is our healer, and nothing is impossible with Him. Mar 1 My story of Grace: Part 1. The beginning.